If you always crave something crunchy and nutritious to munch on, then this is for you. The peanut burger snack is a delicious snack of peanuts coated in a flour mixture and fried to a crunchy texture. Peanuts are prepared using the popular groundnuts we all know! 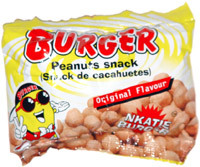 The peanut burger snack is made popular in West Africa by a Burger company in Ghana, who are also the makers of Nkatie Burger snack. This snack is not just healthy but also crunchy, easy to make and the ingredients are easy to find! 3 level cups of groundnuts (Roasted and shelled). 1. Put the ground nuts in a large bowl. 2. Mix the flour and other dry ingredients in a bowl. 3. Whisk the eggs thoroughly, add the flavours and sugar. Mix together till the sugar dissolves. 4. 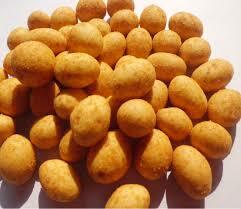 Pour the egg mixture into the groundnuts little at a time and mix such that all the groundnuts are coated. 5. Sprinkle the flour mixture and stir until all the groundnuts are completely coated but aren't sticking together. 6. Deep fry in hot oil until golden brown. 7. Then put the fried peanuts in a colander to strain the oil. 8. Serve alone or with any drink of your choice. You can even package it in cups, bowls, cans or containers and distribute at parties as either appetizers or souvenirs. Or, you can simply make it your brand and sell it to the public. Either way, you just have to enjoy it. Well, that's it. As simple as that. It's important for you to know that peanuts have high nutritional value; the nuts contain protein ideal for skin regeneration. However, for individuals allergic to groundnuts, you can use cashew-nuts as a substitute for groundnuts. And those who have the tendency to gain weight can use honey instead of sugar. Don't forget to share your experiences or questions in the comment box below! Wow!!! this will be a cool business idea! No dear. You can't use yeast! Baking powder is highly recommended!